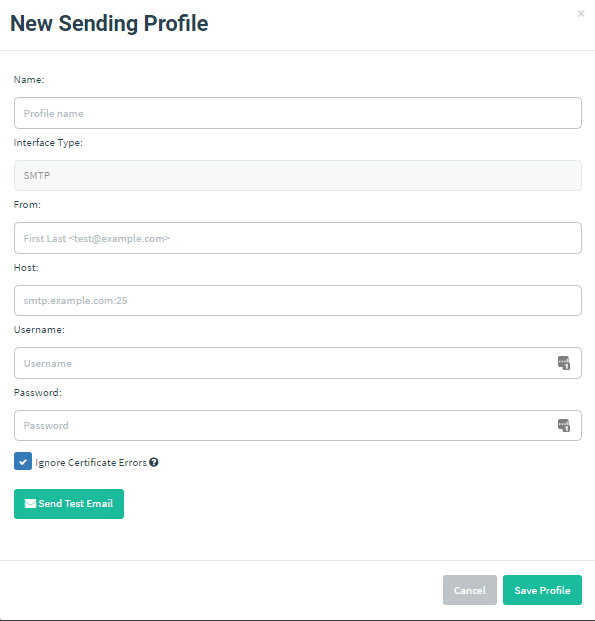 To send emails, Gophish requires you to configure SMTP relay details called "Sending Profiles". To setup a sending profile, click the "Sending Profiles" navigation entry in the sidebar and click the "New Profile" button. Note: If you're looking for a good testing SMTP server, I've had good luck with Mailhog. It's important to make sure that your "From" address is a valid email address format. Additionally, make sure you setup your "Host" in the full host:port format. After entering the recipient details and clicking "Send", you should see a message indicating if the email was sent successfully.